The U.S. Bureau of Labor Statistics (BLS) projects 9.8 million new jobs to be created through 2024, assuming labor productivity growth of 1.8% per year over that period. At the same time, a slowdown in labor force growth is expected due to more workers entering prime retirement age. About 8 million Baby Boomers have dropped from the labor force in the last 4 years and currently hold only 29 percent of U.S. jobs. Meanwhile, Millennials now outnumber Baby Boomers as the nation’s largest living generation. The Class of 2016 should get ready to get down to business in 2017, with employers expected to hire 5.2% more new graduates than they hired from the previous class, according to the National Association of Colleges and Employers. The coming year will bring a renewed emphasis on employer-employee relationships, according to the Global Recruiting Trends 2016 report from LinkedIn Talent Solutions. Nearly 40 percent of respondents say quality of hire — most often measured by employee turnover — is their single most important performance metric. Almost a third also rank employee retention as a top priority over the next 12 months. Companies face the balancing act of recruiting and retaining productive employees while keeping human resources costs in line. Best-in-Class companies are using various tactics to make sure they recruit, inspire and retain top talent. According a recent study by the Aberdeen Group, salary is still one of the most important factors candidates consider when choosing a job. 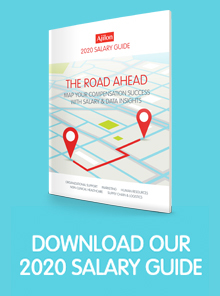 To make sure you’re paying your people right, check out our 2017 Salary Guide. How Does the South China Sea Dispute Impact Supply Chains?